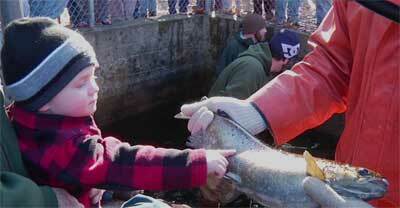 Bring the kids and explore the life cycle of landlocked salmon, fish prized by anglers on New Hampshire's big lakes, at the New Hampshire Fish and Game Department's annual "Salmon Sunday" event on Sunday, November 13, 2011, from 1 to 3 p.m. at Pope Dam in Melvin Village. Pope Dam is nine miles north of Wolfeboro on Route 109 in the town of Tuftonboro, N.H.
"Salmon Sunday is a great chance for everyone to get a close-up look at landlocked salmon from Lake Winnipesaukee in their fall spawning colors," said Don Miller, fisheries biologist for the Lakes Region. "Kids love to see the big salmon, averaging about three pounds each, and watch biologists collect the eggs." During the event, fisheries biologists will be busy harvesting, or "stripping," eggs and milt from adult salmon. Standing knee-deep in the cold water of the Melvin River, scientists expertly relieve the colorful adult female salmon of their eggs by stroking their stomachs. Milt from the male fish is obtained in the same way, and mixed with the gold-colored eggs to fertilize them. This activity is all part of the work N.H. Fish and Game carries out each year, with support from the Federal Aid in Sport Fish Restoration Program, to maintain the landlocked salmonpopulation in New Hampshire's big lakes. Salmon used for the stripping demonstration are netted from Lake Winnipesaukee during October and early November. They are returned to the lake after their eggs and milt have been collected. The fSport Fish Restoration logoertilized eggs are taken to Powder Mill Hatchery in New Durham,where they will hatch in three to four months. The salmon are raised in the hatchery for about 18 months, then stocked into Lake Winnipesaukee and other New Hampshire lakes. Fish and Game staff will be on hand to answer questions about salmon, the egg-stripping process and the stocking program that ensures these beautiful fish continue to be available in the lakes for anglers to catch. Salmon Sunday is a "rain or shine" event. Dress warmly. If you have questions about Salmon Sunday, call 603-744-5470. The New Hampshire Fish and Game Department is the guardian of the state's fish, wildlife and marine resources. To learn more about New Hampshire's freshwater fisheries, visit www.fishnh.com/Fishing/fishing.htm.